"Mériau has created a new work, Debordement. 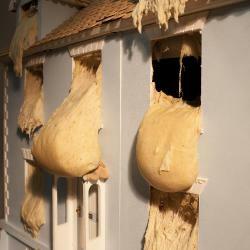 A glut of rising bread dough pushes its way through the windows of a faux-Georgian doll’s house. Filmed over three hours, the work is shown as a 17-minute time-lapse animation, speeding up this normally benign process and giving rise to a new narrative. 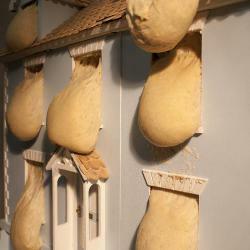 At first passive and alluring, nurturing even, the dough, as it rises, takes on an altogether more menacing stance as it swells and droops. The doll’s house provides a scene of innocence being overwhelmed by homemaking and domestic responsibility. At once seductive and repulsive the work echoes the more sinister folk and fairy tales, from Hansel and Gretel to Babayaga, referring also to the alchemy of cooking and our relationship to food" Day and Gluckman, Collyer Bristow Gallery, 2013.